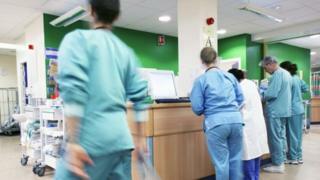 More than 55,000 Northern Ireland health workers are a step closer to receiving their 1% pay rise. Arrangements will be put in place "as soon as possible" for civil servants to implement the wage increase in the absence of a minister at Stormont. The Department of Health said payments, which will be backdated, can be "expected before the end of the financial year". The move ends a dispute about releasing money to nurses and other staff. It comes after the Department of Finance determined pay policy for the 2017/18 financial year. Its permanent secretary Hugh Widdis said: "Setting pay policy would normally be the responsibility of the finance minister. "However, I am very much aware of the pressures on hard working public sector staff and the potential impact on recruitment, retention and morale caused by the current unprecedented situation. "Therefore, having considered all of these factors, I believe this is the most appropriate way to resolve this pressing situation and is in the public interest." The union, Unite, said the deal would be worth "approximately £300 to workers." Spokesman Kevin McAdam said: "This is a welcome development. We have fought long and hard to remove the logjam."